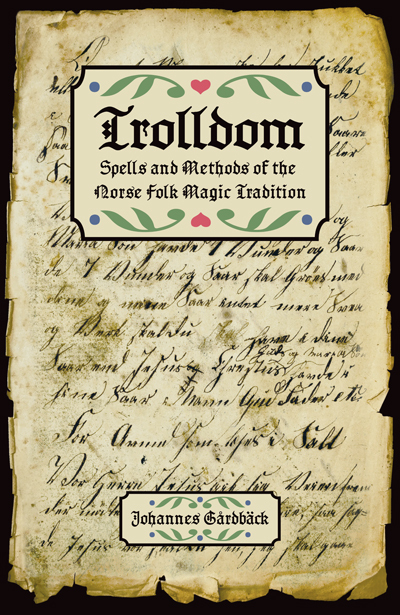 This book is the product of an involved and dedicated practitioner of the Scandinavian folk magic, better known as Trolldom. 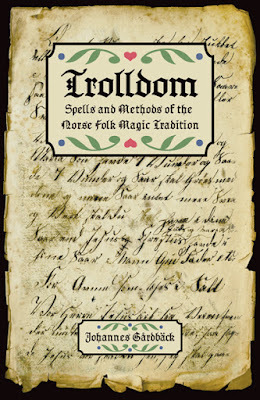 It is truly a delight to see this rich tradition be so well documented in all its variety as in this book that is in essence a gathering of spells and workings. We find here workings for hunting and fishing, court cases, love, gain, protection and destruction. In this way we see from the arsenal of spells how the Scandinavian culture was and what needs magical solutions were applied for and in what ways. Heretical ecclesiastical procedures, appellation to Lucifer and the demonic realm is here presented side by side with the richness of natural sympathies from all kingdoms to give voice to this cultural and magical heritage in its richness and diversity. In addition to this part of spells that constitutes the major part of the book, with enchantments and summoning given both in English and its original phoneme, we also find a great introduction to this art by analysing the varieties within Scandinavia itself and its spread as Scandinavians migrated to America and how these practitioners preserved these customs and also absorbed lore of resonance with the heritage they came with. Between this field of background and the art itself we also find a most interesting discourse on how to become trollkunnig, in other words, how to possess this ‘gift’. Gårdbäck is here commenting on how this gift usually is passed down in the Family and reveal itself in the form of ‘warm hands’, clairvoyance or that the practitioner simply have the gift to cure or curse. On a personal note I would also like to comment on how these practitioners often held special skills, like some were good in stopping blood, others were apt in the use of breath, often called ‘those who breathes or blows’, where the gift of enchantment was prominent. Anyway, Gårdbäck also details ways in how this gift can be taken directly from nature and in this is presenting the ways this gift or heritage is passed on as we find in any stream of witchcraft on the continent. He however emphasizes the importance of this gift being mediated by someone who is already trollkunnig, because in truth this gift is quickened by utesitta (sitting out), a practice that was outlawed in Scandinavia shortly after the advent of Christianity, given how it was ‘awakening trolls’. And in this he comments something crucial on page 37:”Learning from the trolls includes learning from all kinds of spirits. They may be spirits of the dead or ancestors, regardless of whether they are called alver (elves) or trolls, but they may also be the rå-spirits (guardians) of lakes, forests, or rivers”. We can in this also add the aesir and vanir, because, as Gårdbäck points out, until the early 18th Century, there were really not much distinction between these spirits and other types of spirits as everything was sort of contained in the idea of ‘troll’, a mysterious spirit. Beside this the possession of a svartebok (black book) was also considered to be a legitimate transmission in itself, insofar as the practitioner was actually doing the work and reaping the lessons and wisdom coming his way. I wanted to highlight this dimension because this speaks of a living tradition where wisdom is constantly acquired from actively interacting with the spirits of nature as the fundamental way of gaining the ‘gift, it be about given the gift alone, perhaps accompanied by a svartebok or under the tutelage of a trollkunnig. There is much more that could be said of this great gift of trolls, but I will limit myself to congratulate Johannes Gårdbäck on this achievement so marked by a willingness to share in giving such great testament to a tradition well and alive as he has done with this book. You find Dr. Johannes at this site: http://www.therootdoctor.se/where this book can also be ordered.